Hos Dorte: Here Comes Summer, DT card for HM&FMC. Hello, it's Monday again, it comes round so quickly. I hope you’re all OK and have had a lovely weekend. Simon Says Stamp shop is up for grabs for the winner. You had better hop on over to the challenge blog to see all the challenge details. Among them was this cute 'Brighest Bulb' or 'Edisun' as I love to call it. some paper from Echo Park called Splash. and the umbrella is homemade. The cloud is made with a Magnolia Dohickey. The banner die in the same set as the cloud is gone!! and I have cut up the vacuum cleaner bags to look after it. The back side simple as usual, dp and my personal stamp. 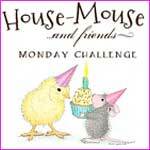 so pop on over to the HM&F Monday Challenge to see them. I love your little umbrella! Here in the UAE, we do not wish for Summer! Have a great day Dot! Hi Dorte, what a lovely card...love the homemade umbralla and the beautiful shell...love the image too! Too bad you lost the banner die! Oh how charming this card is! "Edison" is so cute and your card is delightful! How clever to create the umbrella! Love it! Hi Dorte, what a bright idea! Too bad we can't just pull a string and turn on the sun. Cool and raining here for days now. Love the wavy background and the real shell too. Very creative take on the challenge!!! What a sun filled creation, even with the lightbulb LOL, this is fabulous and a great image you used. Så herlig kort, skikkelig stilig med den lille parasollen! Tusen takk for herlig bidrag til utfordringen vår hos Anonyme Scrappere! 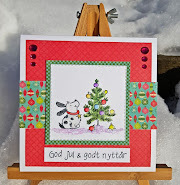 This is gorgeous, I love your fab image and beautiful embellishments. Adorable umbrella and so creative. This is super cute and perfect summer creation. So fun with this great 3D umbrella!!! And I love how you finish the backs of your creations too! Absolutely adorable Dorte, fabulous colours and what a fun image - I'm sad he need a sunlamp for warmth but at least there has a beautifully parasol in case the heat arrives - Tee-hee!!! This is one of the cutest HM cards I've seen yet! That hand-made umbrella looks so adorable! Sweet card!! Hi Dorte, what a cool card and fantastic idea with the parasol. Just great! Thanks also for your visit and your lovely comment on my blog!